May 3, 2017 – With the increased demand for our aircraft brokerage services, Latitude 33 Aviation is pleased to announce the expansion of our aircraft sales and acquisition division. With 14 aircraft transactions worth $60 million completed in 2016 alone, client demand for our expert brokerage services has grown significantly. As a result, Latitude 33 is pleased to welcome Dan Hartley to the team as Director of Aircraft Sales and Acquisitions. Raised in an airline family and soloing on his 16th birthday, Dan is an instrument rated commercial pilot and brings 30 years of aviation experience to Latitude 33. 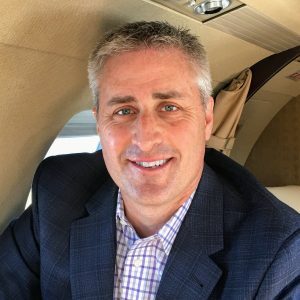 In addition to strong relationships with Textron, Embraer and jet aircraft owners worldwide, Dan’s 24 years of sales and marketing experience with BMW, Mercedes-Benz and the PGA Tour have helped him become a leader in the jet aircraft sales industry. With a fleet of 30 managed aircraft nationwide, most of acquisitions/sales are the result of longtime customer relationships or internal client referrals. Latitude 33 seeks to act as long-term trusted advisor for its clients – whether it is to provide expert guidance for a first-time jet owner, or a CJ4 owner looking to upgrade to a larger jet better suited for international trips. In the last year alone, Latitude 33 Aviation has represented owners of Embraer, Bombardier, and Cessna aircraft. The 2016 Global Business Aviation Outlook from Honeywell forecasts worldwide deliveries of 8,600 new business jets worth $255 billion from 2016 to 2026. Perhaps surprisingly, 39 percent of those purchases are expected to transpire by late 2019. The bulk of demand stems from North America at 65 percent, with operators focusing on “larger-cabin aircraft classes, ranging from super mid-size through ultra long-range and business liner, which are expected to account for more than 85 percent of all expenditures on new business jets in the next five years,” according to Honeywell. In 2016, North America represented 69.6% for General Aviation Airplane Shipments. Cessna had 178 shipments of new aircraft worldwide, Embraer had 117 shipments. These numbers are expected to continue increasing for the coming years according to General Aviation Manufacturers Association (GAMA). Pre-owned jet sales continue to outpace new business jet deliveries by more than 3-to-1, according to JETNET records. In 2016, the number of retail sale transactions of pre-owned light jets in U.S was 862 transactions according to JETNET records. With growing demand from existing clients and the clear industry trends, Latitude 33 is proud to dedicate more resources to aircraft brokerage transactions. Operating the newest and largest fleet of light jets in the United States – along with being the only ARGUS Platinum rated jet operator in San Diego – provides Latitude 33 Aviation with an unmatched ability to provide expert guidance through the aircraft sale and acquisition process.When buying or selling your next aircraft, you can have the peace of mind knowing the team at Latitude 33 Aviation is behind you. Rest assured Dan’s relentless work ethic and persistence, coupled with his market expertise and superior customer service, will not only net you the best deal, but will make it an easy, enjoyable and, dare we say, fun experience!